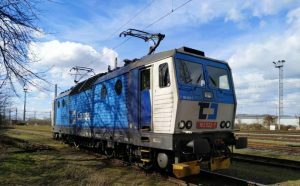 ČD Cargo handed over the first Class 163 locomotive to be equipped with ETCS as part of the project envisaging the on-board system’s installation for 318 traction vehicles, including 9 prototypes. Under the project, ČD Cargo has already signed two contracts to equip 128 traction vehicles, including 3 prototypes. The contracts envisage on-board ETCS installation on 742, 163 and 363 locomotive types. With regard to the Class 742 locomotive, the contractor is working intensively on prototype modernization of the vehicle, while ETCS delivery and installation for the 163 and 363 series is being started by the preparation of a prototype installation of the European security system. The total value of the project is EUR 87.34 million of which EUR 74.24 million is the EU contribution. The European co-financing was awarded under the 2015 CEF Transport Cohesion Call. The total aid amounts to a maximum of 85% of eligible costs, with eligible costs limited to the amount of EUR 250 000 for equipping one traction vehicle. The project concerns the deployment of ERTMS/ETCS on-board components compliant with Baseline 3 on vehicles of ČD Cargo that run on the Orient/East-Med, Rhine-Danube and Baltic-Adriatic Core Network Corridors. According to the project description 345 vehicles, including 21 prototypes and 324 vehicles, will be fully interoperable for smooth international cooperation. EUR 137.51 million was the total eligible cost, with a EUR 116.9 million requested funding. The project to equip all selected vehicles is expected to be completed at the end of 2022.